Dentures Can Last a Lifetime with The Proper Care! 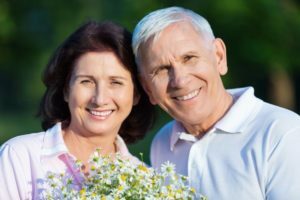 When you invest your time and money into getting dentures in Wylie, you know that you want them to last as long as possible—we don’t blame you! The great news is that dentures from your local dentist are made of high-quality dental materials that are made to withstand reasonable wear and tear. All you must do is maintain their basic hygienic care. Brushing your dentures using a soft-bristled denture toothbrush, removing dental debris. Avoid using regular toothpaste as the materials can be abrasive to the prosthetic. Brush and floss your remaining teeth if you still have any. Even if you have lost all your teeth, it’s still important to massage your gums. With this regular dental hygiene routine and professional care from your dentist, you should be able to keep your dentures for a lifetime. However, there are some cases where a denture can become damaged, like if it accidently falls off the bathroom counter. What Happens When a Denture Becomes Damaged? As you can imagine, when a denture breaks, it can cause a huge inconvenience in your life. You’ll have trouble eating, speaking, and feeling confident in your smile again. You may be tempted to delay having it repaired if it’s not severe damage, but this can cause more extensive issues in the long run. Not to mention, if you wait you could risk damaging your gums from the impaired denture. Instead, visit your dentist for help! As your local trusted dental team, your emergency dentist in Wylie will quickly work to repair your dentures, restoring its fit and function. When you suffer from any oral damage, whether it’s to your natural teeth or restorations, you should always have a reliable dental team to call on. Here at Sachse Family Dentistry, you can depend on your local dental office to provide comprehensive care for the whole family—even your family members that may have already experienced tooth loss! After all, we work to help people repair their smiles and maintain better oral health than they ever had before. You can easily learn more about how we may be able to help you and your loved ones by giving us a quick call today.